One area of possible development for the Aberdeenshire Council website I’d be interested in is adding microformat code into suitable pages. 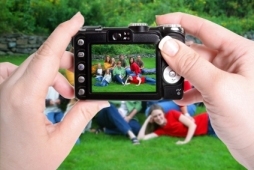 A microformat is a convention for adding information to a web page. The idea is that, as the information conforms to a set format, software can identify and process the information appropriately. It makes the information machine readable. It uses two microformats, hCalendar for the event information and hCard for the contact details. Additionally this also includes location information using the geo microformat. This is all very well but what practical use can microformats be used for. One common way is the use of browser add-ons to read the information so that it can be used as required. Common add-ons are Operator for FireFox and Oomph for Internet Explorer. When you view a page containing microformats the add-ons allow you to save the event into a calendaring system, save the contact details into an address book and view the location in an online mapping system. The event details can be exported to a calendar program such as Outlook or saved to an online calendaring system such as Yahoo. Likewise the contact details can also be saved to Outlook or saved to an online system. Finally the location of the event can be viewed using a program like Google Earth or viewed online using an online mapping website. The actions these browser add-ons allow are cetainly useful but would the number of people using them make the extra work adding microformat content to our website worthwhile. My own feeling is that we could easily add microformat code to pages that are created dynamically but the work adding them by hand to individual pages wouldn’t be justifiable. Inevitably, there are problems associated with microformats. The major problem is that some microformats use the <abbr> tag to hide machine readable code. 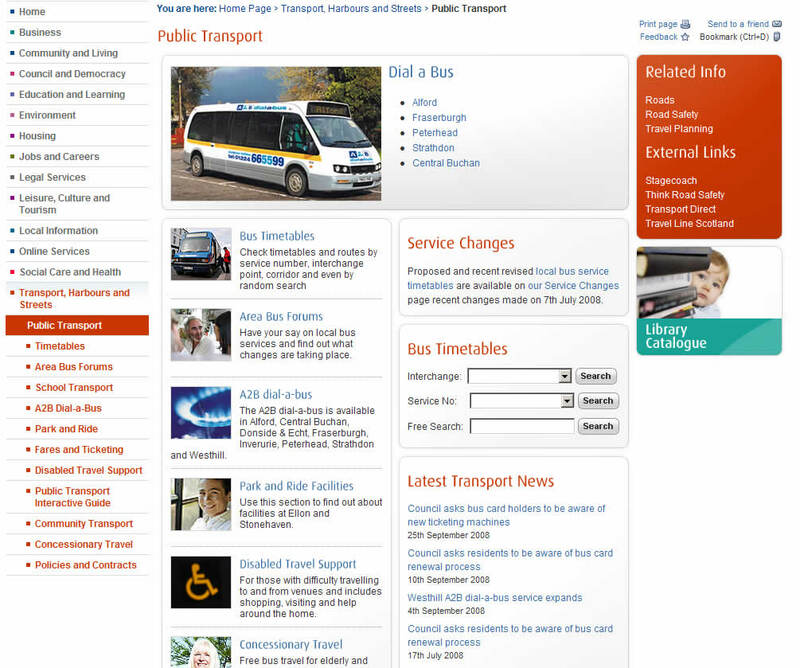 This can cause accessibility problems for screen readers used by the visually impaired. This issue has caused the BBC to stop using these microformats as explained here. Also, microformats are probably only suitable for pages with a small number of events. If we wanted to supply a larger number of events an iCalendar file might be more appropriate. I don’t think microformats are a long term solution but could be useful in the meantime until other approaches, such as embedded XML, are better supported. 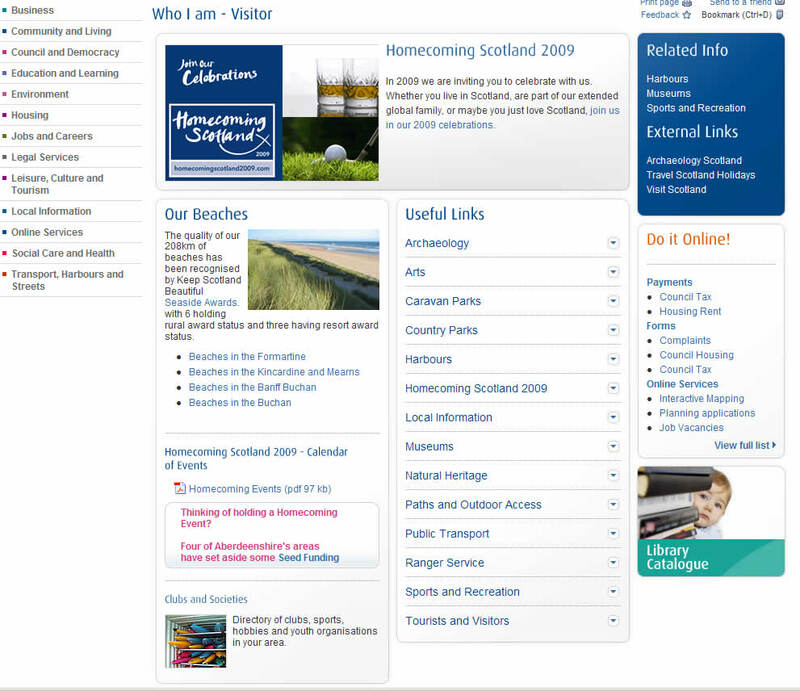 So the question I am asking is, should we start using microformats on the Aberdeenshire Council website? I look forward to any feedback. Further information on microformats can be found at http://microformats.org/. First post for a couple of weeks so apologies for that. The good news is that this was because we’ve been spending all of our time putting the finishing touches to the new design. I’m pleased to say that we have now launched and you can see the fruits of our labour over at www.aberdeenshire.gov.uk. Hopefully it’s worth the wait! Of course, this is not the end of the story. We still have lots of improvements to make and ideas to try out which we just didn’t have time to look at before the launch. So you can look forward to lots more smaller scale changes over the coming weeks and months. If you have any ideas about what you’d like to see us develop then leave a comment here and we’ll see what we can do. In the meantime, do let us know your overall impression of the new design. We’re also interested to hear what you think about the idea of blogging about the process and the future of Mountain to Sea? Thanks to all those that help us out on Friday in both Ellon and Banchory libraries! We found it a really useful exercise and it certainly got us thinking about our new design. Libraries seem to be a great arena for testing and we got a good cross section of users from all different demographics. We were using what’s called the thinkaloud protocol, where we were asking users to speak through what they were clicking on, and why. Bright, Clean, Modern, Professional, but why pink? Why doesn’t libraries have its own section on the left hand side?